Wat Benchamabophit is one of the most beautiful temples you will find in Bangkok. It is famous as the marble temple, and it is a famous tourist attraction. 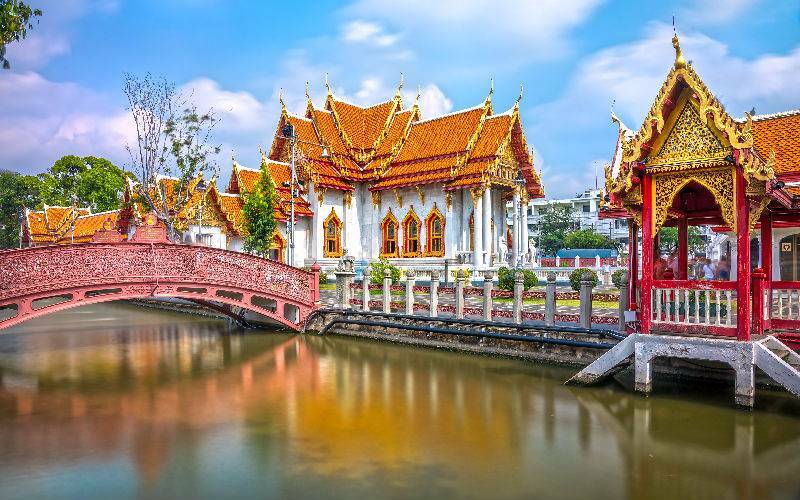 It is the best example of the architectural style of Bangkok with the amazing multi-colored roofs, bird life decorations on the temple and the top it has the roof with gold cravings which makes it more special. On both sides of the entrance, you will find two lions which are supposed to be guarding the temple. Sukhothai-style Buddha statue inside the Wat Benchamabophit is famous. It is the copy of Phra Buddha Chinnarat that you will find in Phitsanulok. In Wat Benchamabophit you will find 52 pictures of Buddha that are from different periods of his life as well as the famous Bodhi tree that came from Bodhgaya, India. It was the place where Buddha reached his enlightenment. 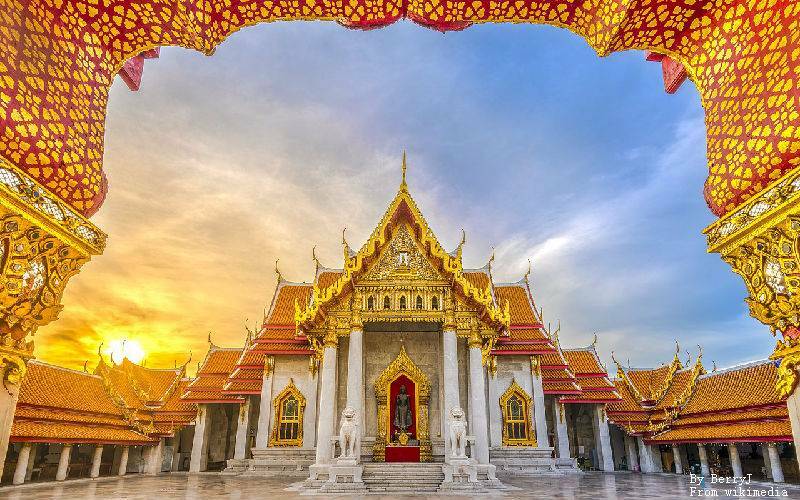 Picture: The Bangkok Marble Temple at sunset. The marble temple known as Wat Benchamabophit is known as the most beautiful places in Thailand. Prince Naris, son of King Rama, designed Wat Benchamabophit because of he as the best architect of that time. Traditional Thai symmetrical style was used for the construction of the temple. Finest marble was imported from Italy for construction of Wat Benchamabophit. The interior of the Wat Benchamabophit has a mixture of European and Thai culture which makes it even more attractive and stylish. There are different carvings inside and outside the temple which makes it more presentable and appealing. There are many tourists who specially come to visit the temple to explore its beauty. You will find 53 images of Buddha in Wat Benchamabophit, and 33 of them are original whereas 20 have been copied. You will find images in the courtyard of Wat Benchamabophit. In the images, you will find all styles of Buddha. In Wat Benchamabophit it is the perfect place to relax or walk. You will find the Chinese style footbridge as well as the various blooming lotus in this location. Picture: The Bangkok Marble Temple, Wat Benchamabophit Dusit wanaram. In 1899 the Wat Benchamabophit was first designed, and it took many years to complete construction of the temple. It has been attracting people from around the world because the Chinese and European designs that it influences. Wat Benchamabophit is the 1st temple that is known among the highest grade Royal temples in the world. The temple is open daily from 8 am until 5:30 pm. 69 Nakornpathom Rd, Dusit, Bangkok 10300, Thailand. You have to dress properly if you want to visit Wat Benchamabophit because the temple has the highest importance in the country. Wat Benchamabophit is in the intersection between Thanon Si Ayutthaya and Thanon Rama V. no doubt it is in the center of the city, but it is still away from most of the temples that are commonly visited. Just take the MRT subway or Skytrain to reach Wat Benchamabophit because it is better as compared to a taxi.